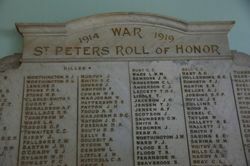 St Peters Town Hall Honour Roll commemorates those from the district who served in World War One. 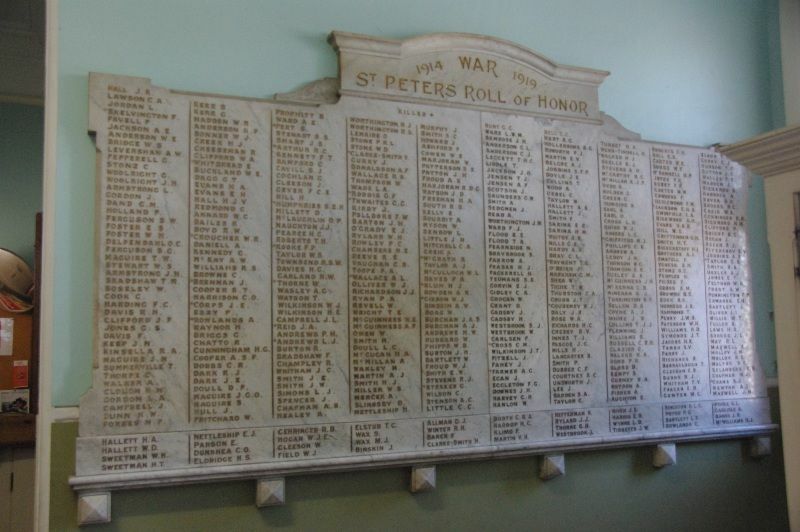 At the St Peters Town Hall yesterday afternoon the war trophies allotted to the district together with the completed portion of the honour roll were unveiled by Brigadier General C.F. Cox, C.B., C.M.G., D.S.O., V.D. Brigadier General Cox was received with a guard of honour of Boy Scouts. The Mayor of St Peters (Ald. W. R. Green) stated that on the whole of the honour roll appealed 475 names while there were many men who had enlisted from the district whose names had not yet been secured. The expense of the honour roll tablets which are of white marble with names chiselled in gold had been borne partly by the council, but mostly by public subscription. The Sydney Morning Herald (NSW), 27 February 1922.